At the beginning of the 12th century, was a simple priory. 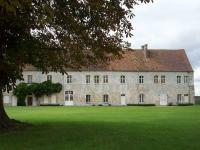 About 1190, Robert, Earl of Leicester founded the Abbey of Fontaine-Guérard. 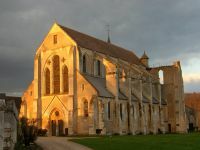 The nuns joined the order of Cîteaux in 1207 as Daughter-abbey of Clairvaux, but did not receive Abbey status until 1253. 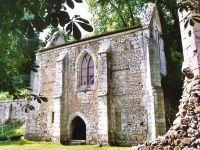 By this date, the buildings we see here were complete; the church having been consecrated in 1218. Sold for the national good, the abbey was then converted as a cotton mill, and then bequeathed in 1937 to the Salvation Army, whose Foundation even now manages the abbey and its restoration. Founded in the late 12th century, the monastery is considered by specialists as one of the finest examples of the Norman Gothic style, the rigor which takes its Cistercian purity. You will discover the nuns' building (chapter house, workroom, and dormitory) and its superb structure, the church, the original chapel modified at the 15th century and the surprising cave cellar. The gardens, including the medicinal one, are currently being restored. Throughout the tourist season, exhibitions and various workshops take place in these building classified Historic Monument, offering you exceptional enjoyment.